Julis and Ayato are officially tag-team partners, and the two now train furiously for the Festa competition to represent Seidoukan Academy against the other schools on Asterisk. Despite Ayato being quite powerful, he still can’t seem to maintain his power beyond five minutes of fighting, and this proves to be a problem for him after he ends up in a duel with the mysterious Kirin Toudou. While Ayato is concerned about Kirin, the other schools, including Allekant Academy, begin to make their preparations for Festa. 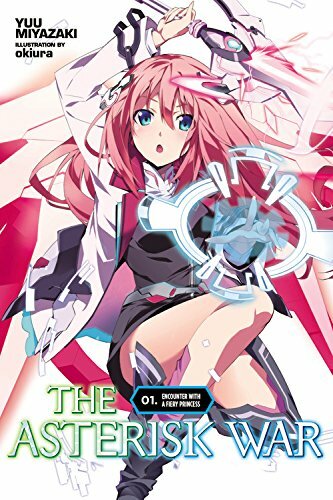 I was pleasantly surprised with how much I enjoyed The Asterisk War’s first volume thanks to the way that it told a straightforward and relatively uncluttered story with some good action and interesting characters. To my disappointment, this volume eschews this focus by introducing many new characters, and in the end it loses much of what made the first volume an enjoyable read. The relationship between Julis and Ayato provided the driving force in The Asterisk War’s first volume, and I enjoyed watching the two of them develop together over the course of a straightforward yet readable adventure. In contrast, this volume shifts away from Julis by immediately introducing a number of new characters, and chief among them is thirteen-year old Kirin Tendou. To put it simply – Kirin is a boring character with very little in the way of interesting motivations, and the main plotline of this volume follows Ayato as he gets involved with the relationship between Kirin and her uncle. This storyline is very straightforward, but it lacks any sort of meaningful character development beyond a surface level. In particular, Ayato remains stagnant throughout this entire volume, and this was a disappointing follow-up to the way that he and Julis grew through learning about one another throughout the first volume. Kirin’s plotline is paper-thin in the sense that it all plays out exactly like you would expect in terms of the relationship between her and her uncle, and the result is that you could probably safely skip this entire volume by reading a two sentence synopsis of what happens because of how little depth there is here. I’m not sure why Miyazaki decided to shift away from Julis after spending doing a fairly good job giving her some depth in the first volume, and it was really disappointing to see how little of a role she played in this volume. The only good news about this volume is that the action scenes remain quite readable, but there are little in the way of actual stakes here and a lot of techno-jargon to sift through here without much of a recap of how things worked from the first volume. This volume also increases the focus on the political intrigue between the various academies on Asterisk as the Festa approaches, and this was also generally uninteresting to see. Part of the problem here is that so much of the discussion about the makeup of Asterisk is in confusing chunks of exposition – for example, the first chapter shows a conference between the student council presidents of the various schools, but so many new characters and schools are introduced so rapidly that none of it has any real sort of impact. This series hasn’t given us a reason to really care about the plotting at hand or the relationship that Seidoukan has with the rest of the schools, and I found this and the rest of the references to the other schools to be a complicating slog even as the book dove a little bit deeper into the leadership of the opposing Allekant Academy. The Asterisk War’s first volume managed to walk the fine line in terms of including the usual nonsense fanservice tropes (ie. Ayato walking in on Julis changing, his observations of Claudia, etc.) without going too far or substantially distracting from the main plot, but this volume crosses that uncomfortable line in a number of instances particularly where Kirin is involved. Just about every scene between Kirin and Ayato seems to have some sort of “and Ayato couldn’t help but notice how well-developed she was for a thirteen-year old” moment in it, and this was quite unnecessary and generally uncomfortable to see repeated over and over again. There is really no reason why this needed to be included so often, and I found this pandering to be quite off-putting particularly because it took up so much of the focus in scenes that could have otherwise been used to develop the plot or these characters in a more interesting manner. 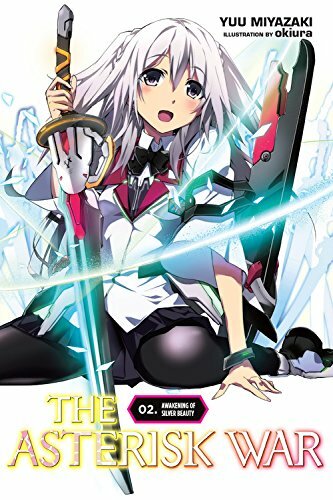 The Asterisk War Vol. 2 is a disappointing follow-up to this series' surprisingly enjoyable debut. There are a number of problems here – the general triteness of Kirin’s story, the ungrounded emphasis on the political intrigue between Asterisk’s academies, and the frequent leeriness towards Kirin on Ayato’s part – but I was most disappointed by how the character development from the first volume was seemingly discarded to spread the focus in a number of different directions. The action scenes are fine, but that’s really all that I can recommend about this volume, and it’s a real shame to see such a weak follow up as this series moves forward. 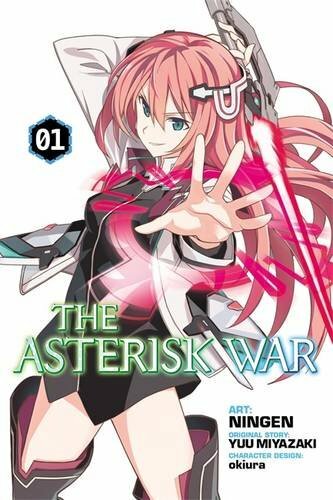 The Asterisk War Vol. 2: Awakening of a Silver Beauty was translated by Melissa Tanaka and published by Yen Press on December 20th 2016. Authored by Yuu Miyazaki, the series is currently ongoing and published by ASCII Mediaworks’ Dengeki Bunko imprint.